Whether it is a roof for a new home or for an extension, cost is always a consideration when choosing a roofing material. While asphalt shingles are an attractive option because of the price, the material you chose for the roof should be of the highest quality possible. The reasons for this are obvious as the roofing type you choose will have an effect on your property’s value, but more importantly on the level of protection it will provide to your home. 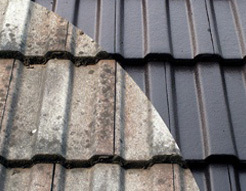 There are many types of roofing materials, two of the most common being concrete roof tiles and asphalt shingles. 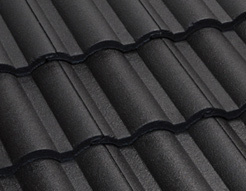 Between the two of these roofing materials, concrete tiles have more advantages and should be considered as the best choice. There are many advantages of having concrete roof tiles on a home, such as the variety of colours available to choose from that can match nearly any residential property’s aesthetics. Concrete is also hardier than any other alternative roofing material in the market. Unlike the few shades of colour available and the limited durability of asphalt shingles, concrete roofing tiles can’t be beat. 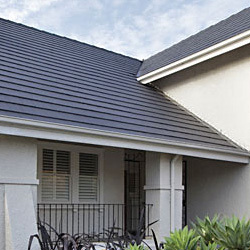 Superior durability – that is what you can expect from concrete roof tiles, these will last as long as a well-built home, unlike asphalt shingles which are ultimately only a temporary roof solution that will need to be replaced every 15-20 years. Many property owners don’t realise how fragile asphalt roofing shingles are, but concrete roofing tiles are not like that. In fact, concrete roof tiles can make a home stronger, as these can withstand all types of harsh weather. Beautiful appearance and Eco-friendly – no other roofing material can compare to the available colours of roof paint that can be used with concrete roof tiles. Also, unlike asphalt shingles, concrete tiles such as Boral concrete tiles are not made using petroleum-based products and do not pose a danger to landfills or the environment. While asphalt shingles are an affordable option, in the beginning, these are not as strong, or will last as long, as concrete tiles and will cost more to maintain as years pass. So, if you are in the market for a new roof, and you would like to learn more about the benefits of Boral concrete tiles, then visit the showroom at Ajax Gregson Tiles today. If you want to invest in high quality roofing tiles that will last you for decades to come, and that look great, then visit us here at Ajax Gregson Tiles, we can help you find the right roofing material that best suits your home.